The AES Show, professional audio’s main expo, may have found its 21st century stride in a first-ever co-location with The NAMM Show, the musical-instrument expo. Last week’s [email protected], as the initial partnership was dubbed, gave the former access to the younger demographics of the latter, helping expose its members to a wider range of professional audio pathways, including broadcast, while putting more professional-grade audio technology before a larger audience. The 2018 [email protected] Pro Sound Symposium: Live & Studio sessions emphasized practical content, offering access to more than 500 panels and presentations over four days, as well as a chance to meet audio professionals working in a variety of verticals. Clear-Com’s President Bob Boster (center) and Regional Sales Manager Jay Wallace (left) accept the National Association of Music Merchants Milestone Award from NAMM President/CEO Joe Lamond. Sponsoring [email protected] Pro Sound Symposium: Live & Studio 2018 were Apogee, Adamson, Allen & Heath, Alteros, Bose Professional, DAD (Digital Audio Denmark), dB Technologies, EAW, DiGiGrid, Eventide, Focal, Genelec, Lectrosonics, Meyer Sound, QSC, Sennheiser, Ultimate Ears, Waves and Yamaha. 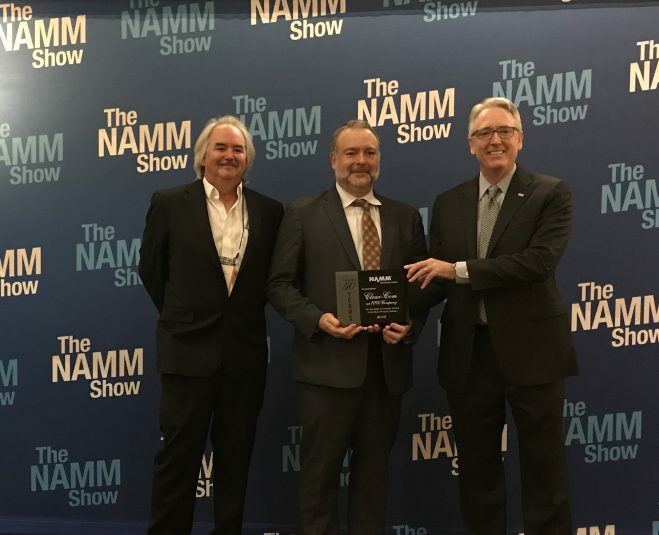 Also at The NAMM Show, intercom developer Clear-Com was presented with the National Association of Music Merchants Milestone Award for 50 years of service in the music-products industry. Presented annually, the Milestone Award recognizes music businesses that have flourished through changing business environments to reach a noteworthy anniversary. The expo filled every bit of the Anaheim Convention Center’s 1.8 million sq. ft. — including 200,000 sq. ft. of new exhibit space that opened in September — added convention space that allowed NAMM to grow attendance by as much as 10% percent over last year’s nearly 107,000 visitors, according to NAMM President/CEO Joe Lamond. Here’s a look at some of what attendees got to experience there. Sony’s third-generation DWX Series of wireless mics delivers ultra-low audio latency of 1.2 ms with extended bandwidth and high-density multichannel operation, with a high-dynamic-range RF circuit and four-diversity-antenna configuration, and supports Dante digital audio networking. The new DWX components include the smaller and lightweight DWT-B03R digital wireless bodypack transmitter, the DWR-R03D digital wireless rackmount receiver, the BC-DWX1 battery charger, and the ECM-77LM miniature, omnidirectional electret condenser microphone. The new DWX also includes the new ECM-77LM miniature, omnidirectional electret condenser microphone, which now uses the small three-pin connector. At The NAMM Show, Sennheiser announced that it will be expanding its XS Wireless 1 series with the addition of a new two-channel receiver, the EM-XSW 1 DUAL. The receiver will be available separately or as part of two XSW 1 DUAL Sets, which combine it with two wireless microphones using either the e 825 or e 835 capsule. The new XS Wireless DUAL two-channel receiver features automatic frequency management with one-touch synchronization, antenna-switching diversity for reliable reception, and intuitive, icon-based controls. Each receiver has up to 10 compatible, preset channels in eight frequency banks and provides balanced XLR and unbalanced jack outputs. The XSW 1 DUAL Sets are available in various frequency ranges within the UHF band (A: 548-572 MHz, GB: 606-630 MHz, B: 614- 638 MHz, C: 766-790 MHz, D: 794-806 MHz, E: 821-832 MHz plus 863-865 MHz, K: 925-937.5 MHz) and will be available globally in April. Sennheiser also announced major upgrades to its Digital 6000 wireless microphone system, including free firmware update for all EM 6000 receivers that enables a command function that lets users set up a talkback channel with suitable transmitters. Genelec showcased its new 8341 and 8331, the world’s smallest three-way coaxial monitors and part of the 8351 three-way Smart Active Monitor group of near-field monitoring products. The 8341 and 8331 provide extremely accurate imaging and improved sound quality, both on- and off-axis, vertically as well as horizontally. Like the 8351, both the 8341 and 8331 can be oriented horizontally or vertically using an adjustable IsoPod base for isolation, offering maximum flexibility to fit even the tightest of working environments. Innovations include a motor assembly enabling the midrange and the tweeter to share the same compact magnet system, reducing size and weight with no reduction in response. The midrange coaxial driver cone is now composed of concentric sections, optimizing midrange linearity — as does the DCW, which covers the entire front face of the enclosure. Each unit incorporates three stages of dedicated Class D amplification, developed in-house by Genelec and including eco-friendly Intelligent Signal Sensing (ISS) energy-saving technology. Avid announced a new version of Pro Tools. Among the new features of Pro Tools 2018 are Track Presets, retrospective MIDI record, MIDI editing enhancements, and Playlist Comping enhancements. Track Presets enabling quick preset browsing to build sessions on the fly. New playlist-comping workflows to save valuable screen real estate and provide the ability to easily edit grouped tracks, work quickly from Waveform view, and easily convert sessions to cloud-enabled product files for faster collaboration. Pro Tools 2018 is available now.